There are many other features in the head that help us become exceptional long-distance walkers and runners. I became obsessed with the idea that humans evolved to run long distances, evolved to walk long distances, basically evolved to use our bodies as athletes. These traces are there in our heads along with those brains. 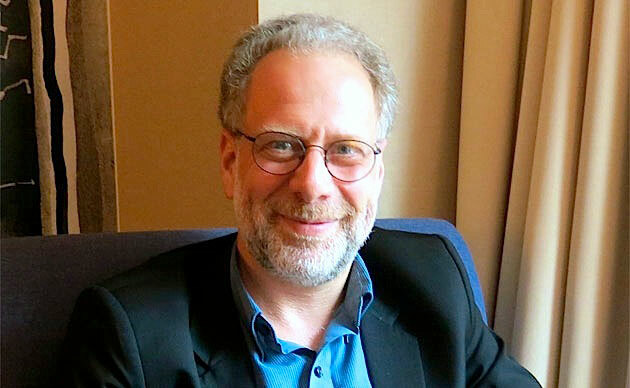 DANIEL LIEBERMAN is Professor of Human Evolutionary Biology at Harvard University. His research combines experimental biology and paleontology to ask why and how the human body looks and functions the way it does. He is especially interested in the origin of bipedal walking, the biology and evolution of endurance running, and the evolution of the human head. He also loves to run. I've been thinking a lot about the concept of whether or not human evolution is a story of brains over brawn. I study the evolution of the human body and how and why the human body is the way it is, and I've worked a lot on both ends of the body. I'm very interested in feet and barefoot running and how our feet function, but I've also written and thought a lot about how and why our heads are the way they are. The more I study feet and heads, the more I realize that what's in the middle also matters, and that we have this very strange idea —it goes back to mythology—that human evolution is primarily a story about brains, about intelligence, about technology triumphing over brawn. Think about Greek myths, like the myth of Prometheus and Epimetheus. Epimetheus, which means "hindsight," is the Titan who gave out all the gifts to the animals, and when he finished, he hadn't given any gift to humans. Prometheus took pity on these poor humans who didn't have claws and fangs and speed and power, so he gave humans fire. Of course, he got tortured by the rest of the gods for this. I think that this idea, that humans are essentially weak creatures, is actually deeply woven into a lot of the ways in which humans think about our bodies. Another good example of this would be the Piltdown hoax. The Piltdown forgery was a fossil that was discovered in the early 1900s, in a pit in southern England. This fossil consisted of a modern human skull that had been stained and made to look really old, and an orangutan jaw whose teeth had been filed it down and broken up, all thrown into a pit with a bunch of fake stone tools. It was exactly what Edwardian scientists were looking for, because it was an ape-like face with a big human brain, and also it evolved in England, so it proved that humans evolved in England, which of course made sense to any Victorian or Edwardian. It also fit with the prevailing idea at the time of Elliot Smith, that brains led the way in human evolution because, if you think about what makes us so different from other creatures, people always thought it's our brains. We have these big, enormous, large, fantastic brains that enable us to invent railways and income tax and insurance companies and all those other wonderful inventions that made the Industrial Revolution work. It turned out that the Piltdown Man was a fraud, and it turns out also that the idea that brains got large early on in human evolution is incorrect as well. We now know that humans and chimpanzees split maybe around six to seven million years ago, and the very earliest hominins, those are creatures that are more closely related to humans than to chimpanzees, had really small brains. In fact, early Australopithecus, like Lucy, also had quite small brains. Even the early members of the genus Homo had small brains. Some tools first started appearing around 2.6 million years ago, and those hominins have slightly larger brains than Australopithecus. But if you actually factor out the effects of body size, what's called their encephalization quotient (the ratio of brain size to body size for what you expect for a mammal of a body size versus what you actually got) it was actually not that much bigger than chimpanzees or early Australopiths. To put it into perspective, an EQ of one means that your brain size is exactly the size of a brain you predict for your body size. Chimpanzees have an EQ of 2.1, and humans have an EQ of about f5.1. Australopiths have EQ’s of about 2.5, and the earliest members of the genus Homo have EQ’s of about 3.0 to 3.3. Their brains are a little bit bigger than a chimpanzee’s, but not hugely so, and it wasn't until long after the genus Homo evolved that brains actually started getting really, really large. So increases in brain size were not really an early event in human evolution, and in fact, they didn't occur until after hunting and after the invention of hunting and gathering, and not even until cooking and various other technological inventions, which gave us the energy necessary to have really large brains. Brains are very costly. Right now, just sitting here, my brain (even though I'm not doing much other than talking) is consuming about 20- 25 percent of my resting metabolic rate. That's an enormous amount of energy, and to pay for that, I need to eat quite a lot of calories a day, maybe about 600 calories a day, which back in the Paleolithic was quite a difficult amount of energy to acquire. So having a brain of 1,400 cubic centimeters, about the size of my brain, is a fairly recent event and very costly. The idea then is at what point did our brains become so important that we got the idea that brain size and intelligence really mattered more than our bodies? I contend that the answer was never, and certainly not until the Industrial Revolution. Why did brains get so big? There are a number of obvious reasons. One of them, of course, is for culture and for cooperation and language and various other means by which we can interact with each other, and certainly those are enormous advantages. If you think about other early humans like Neanderthals, their brains are as large or even larger than the typical brain size of human beings today. Surely those brains are so costly that there would have had to be a strong benefit to outweigh the costs. So cognition and intelligence and language and all of those important tasks that we do must have been very important. We mustn't forget that those individuals were also hunter-gatherers. They worked extremely hard every day to get a living. A typical hunter-gatherer has to walk between nine and 15 kilometers a day. A typical female might walk 9 kilometers a day, a typical male hunter-gatherer might walk 15 kilometers a day, and that's every single day. That's day-in, day-out, there's no weekend, there's no retirement, and you do that for your whole life. It's about the distance if you walk from Washington, DC to LA every year. That's how much walking hunter-gatherers did every single year. In addition, they're constantly digging, they're climbing trees, and they're using their bodies intensely. I would argue that cognition was an extremely important factor in human evolution, along with language, theory of mind — all those cognitive developments that make us so sophisticated. But they weren't a triumph of cognition over brute force; it was a combination. It was not brains over brawn, it was brains plus brawn, and that made possible the hunter-gatherer way of life. What hunter-gatherers really do is they use division of labor, they have intense cooperation, they have intense social interactions, and they have group memory. All of those behaviors enable hunter-gatherers to interact in ways such that they can increase the rate at which they can acquire energy and have offspring at a higher rate than chimpanzees. It's a very energetically intensive way of life that's made possible by a combination of extraordinary intelligence, inventiveness, creativity, language, but also daily physical exercise. The other reason we often discount the importance of brawn in our lives is that we have a very strange idea of what constitutes athleticism. Think about the events that we care about most in the Olympics. They're the power sports. They're the 100-meter dash, the 100-meter freestyle events. Most athletes, the ones we really value the most, are physically very powerful. But if you think about it this way, most humans are wimps. Usain Bolt, who is the world's fastest human being today, can run about 10.4 meters a second, and he can do so for about ten or 20 seconds. My dog, any goat, any sheep I can study in my lab, can run about twice as fast as Usain Bolt without any training, without any practice, any special technology, any drugs or whatever. Humans, the very fastest human beings, are incredibly slow compared to most mammals. Not only in terms of brute speed, but also in terms of how long they can go at a given speed. Usain Bolt can go 10.4 meters a second for about ten to 20 seconds. My dog or a goat or a lion or a gazelle or some antelope in Africa can run 20 meters a second for about four minutes. So there's no way Usain Bolt could ever outrun any lion or for that matter run down any animal. A typical chimpanzee is between about two and five times more powerful than a human being. A chimpanzee, who weighs less than a human, can just rip somebody's arm off or rip their face off (as recently happened in Connecticut). It's not that the chimpanzee is remarkably strong, it's that we are remarkably weak. We have this notion that humans are terrible natural athletes. But we've been looking at the wrong kind of athleticism. What we're really good at is not power, what we're really phenomenal at is endurance. We're the tortoises of the animal world, not the hares of the animal world. Humans can actually outrun most animals over very, very long distances. The marathon, of course, is a very interesting example. A lot of people think marathons are extraordinary, and they wonder how many people can run marathons. At least a million people run a marathon every year. If you watch any major marathon, you realize that most of those folks aren't extraordinary athletes, they're just average moms and dads. A lot of them are charity runners who decided to raise money for some cancer cause or diabetes or something. I think that proves that really your average human being can run 26.2 miles without that much training, or much ability to be a great athlete. Of course, to run a marathon at really fast speeds is remarkable, but again, it just takes some practice and training. It's not something that's really extraordinary. We're actually remarkable endurance athletes, and that endurance athleticism is deeply woven into our bodies, literally from our heads to our toes. We have adaptations in our feet and our legs and our hips and pelvises and our heads and our brains and our respiratory systems. We even have neurobiological adaptations that give us a runner's high, all of which help make us extraordinary endurance athletes. We've lost sight at just how good we are at endurance athleticism, and that's led to a perverse idea that humans really aren't very good athletes. A good example is that every year they have races where they actually compare humans and horses. In Wales, this started a few years ago, I guess it started out as a typical sort of drunken pub bet, where some guy bet that a human couldn't beat a horse in a marathon. They've been running a marathon in Wales for the last, I think 15-20 years. To be fair, most years, the horses beat the humans, but the humans often come very close. Whenever it's hot, the humans actually beat the horses. They also have now ultramarathons in Arizona, where humans race horses. Again, most years, the horses beat the humans, but every once in a while, the humans do beat the horses. The point is not that humans are poor athletes, because the horses occasionally beat us, but humans can actually compete with and often beat horses at endurance races. Most people are surprised at that. These are horses with riders on them. One of the interesting things about these races also is that they're so worried about the horses getting injured, that the horses have mandatory veterinary check-ups every 20 kilometers, but not the humans, because humans can easily run 40 kilometers without injury. But if you make a horse gallop for more than 20 kilometers, you seriously risk doing long-term permanent musculoskeletal damage to the horse. Until extremely recently, you couldn't live, you couldn't survive as a human being without being an endurance athlete. Not just hunting and gathering requires athleticism but also being a farmer. Subsistence farmers have to work extremely hard. Until the invention of industrialized machinery, farmers had to work even harder than hunter-gatherers, often spending many thousands of calories a day. They have to dig ditches and throw vast quantities of hay into bales and they have to schlepp stuff all over the place. Farmers had to work brutally difficult, hard, exhausting lives. It wasn't until, again, the invention of new technologies such as domesticating animals or even more recently machinery such as the internal combustion engine, that farmers were able to live non-grueling lives. It's only in the last 100 years, in fact maybe for many people the last 20, 30, 40, 50 years, that human beings have been able to lead extremely sedentary lives without any physical activity. A typical American today living in a post-industrial information technology world can get up in the morning, reach to the cabinet, get breakfast cereal that's in a box, pour it, reach to the refrigerator, pour some milk in there. He or she can spend his or her entire day without ever elevating his heart rate or her heart rate. You can sit in wheelie chairs all day long, take an elevator to your floor, sit in a chair all day long staring into a computer, and drive home from work. Dinner basically involves pressing a few buttons, or if you have to go to the supermarket, wheeling around a cart. Human beings today don't have to engage in physical activity anymore. It's natural and normal for us to think that the world around us is normal. But our world, our lives today are profoundly abnormal, especially in the case of no longer having to use physical activity as part of our daily routine. We've also got this bizarre notion that finally came true, that our bodies don't really matter. Think about St. Thomas Aquinas, who believed that the flesh was irrelevant and that all that really mattered was your soul. But only monks and rich clerics in Europe could get away with that kind of opinion in the Middle Ages, because everybody else had to work like a dog. But now, your average human being can live a life of ease and luxury, much more physically inactive than even kings and queens of Europe in the old days. We've finally been able to realize St. Thomas Aquinas's dream of basically ignoring the flesh, ignoring the body. The result is an epidemic of obesity and heart disease and various kinds of cancers such as colon cancer and breast cancer that largely come from physical inactivity combined with a really loathsome diet. What's interesting is that there's a reversal of class today. Now, it's only the very wealthy who can afford to be physically active and to eat a good diet, and it's the lower classes, the people in the working classes that cannot afford to actually be physically active. People who are well-off, the one-percenters or maybe the five-percenters of our country, can afford to go to health clubs and take yoga classes and buy organic food. But most Americans today, particularly those who are in the working class, have to work all day long, they have to commute long hours. They don't have time to exercise; they can't afford to buy food that's very healthy. The result is that there's now an interesting reversal that never occurred before in human evolution, which is that the wealthier you are, the healthier you are. It used to be that it was only the very wealthy who could afford to get heart disease. The first example we know of heart disease is actually from a CT scan of an Egyptian princess from her sarcophagus. She was mummified, and a CT showed that she's the oldest case of heart disease. It's not coincidental that this was a pharaoh's daughter. She clearly was able to hang around in the palace all day long and eat too much and not have to exercise. But that was a luxury until recently of only the wealthy, and now it's completely flipped. I'm a professor of human evolutionary biology, and I've long been fascinated by heads, because our heads are actually really unusual. If you were to meet a Neanderthal or Homo erectus on the street in New York City, for example, you'd probably stare mostly at their heads. Their bodies would be very similar to yours and mine, but they'd be really different from the neck up. If there's really one important part of the human body that we need to understand to understand why we are the way we are, it's our heads. In addition, heads are really complicated. If you think about your head, almost every particle that enters your body goes through your head. Everything you breathe, everything you eat, and everything you smell. Almost everything goes through your head, and a lot of really major functions also go on in your head. You speak in your head, you smell, you taste, you chew, you think, your sense of balance is in your head, I could go on. And yet all of that is packaged into a tiny space about the size of a soccer ball, and if anything goes wrong with anything, you're dead. If you can't breathe, speak, swallow, smell, taste, hear properly, until recently, you were immediately selected out of the gene pool. Heads are also fascinating. On the one hand, you’d think because of all that complexity that they'd have to be the most constrained part of the body, right? You can't let anything go wrong in a head or you're dead. But on the other hand, it turns out that heads are pretty much the most evolvable parts of our body. They're the parts of our bodies that seem to have changed the most. As I said, if you met a Neanderthal or a Homo erectus you'd be mostly different from the neck up, not from the neck down. I've long been interested in how heads can be so evolvable and what the story of the head tells us about human evolution. Part of that is about the brain. Human brains got bigger and that's a major effect on their heads, but your brain is actually the same size as a brain of a Neanderthal. Actually, it's a little bit smaller than a Neanderthal’s, and our brains are only a little bit larger than a late Homo erectus. So what's really different about our heads is not the size of our brains, it's really other aspects of our heads. The most important difference is the size of our face. Humans are profoundly different from every other hominin, which is a species more closely related to humans than to chimps. Our difference from other hominins is primarily the size and position of our face. What we've done in our recent evolution is we've shrunk our face and we've retracted it. Our face is now underneath our brains rather than sticking in front of our brains. That's why we don't have big brow ridges, and that's why our tongues and mouths are small, which causes our larynx to be low and changes the shape of the vocal tract. In working on heads, I came to the conclusion that although brains are really important in human evolution, there's so much else about the head that's really unique, that doesn't actually have that much to do with the brain. I'll give you an example related to running. When we run, humans can't control our heads the way any other animal can. If you ever watch a dog or a horse run, its head is like a missile on a body. The body is moving and the head stays stock-still. That's for a very important reason – because of gaze. You need to stabilize your gaze in order to see where you're going. If the world is very jiggly, if this camera now were jiggling around, it would be sickening to watch me or any other video. We need to have a stable image in order for us to evaluate it, to use that information. If you're running across a landscape, and the world is jiggling really horribly, you won't be able to see where rocks are, you won't be able to see where other obstructions are, you won't be able to see where your prey is. You won't be able to function effectively. For example, if you were to trip over a rock in the Ice Age, that's a huge selective problem. Today, if we trip and sprain our ankle or break our leg, okay, it's a big pain, but you can go see a doctor and they'll set it straight, and you can use crutches. But imagine you sprained your ankle 15 miles from home in the Pleistocene. You'd be easy pickings for a saber-toothed tiger or a lion or some other animal. Injuries, damage to your body, was a far greater selective problem in human evolution than it is today. It turns out that humans have special features in our heads, we've discovered, that enable us to keep our head still. The reason a dog or a horse or any other quadruped can keep its head still is because its neck is cantilevered off its thorax, or its body, so it sticks out horizontally, and then the head attaches to the neck from the back, and it's also sticking out horizontally. The three units: the head, the neck and the body, can all rotate independently, thereby keeping the head still. That's what an animal does when it runs. When a human being runs, we have a tiny, little neck that emerges from the center of the base of our skull, and it's very short in the middle. We're basically like pogo sticks. We've lost, by becoming bipeds, all those mechanisms available to quadrupeds to keep their heads still. It turns out that we've evolved other special mechanisms to keep our heads still. One of them, the semicircular canals (the vestibular system in our heads) are especially enlarged, and give us enormous sensitivity to pitching forces, to pitching motions. The semicircular canals, the vestibular system are organs of balance that essentially function as an accelerometer. As your head pitches forward, as it does every time you hit the ground when you run, your head wants to pitch forward. As it pitches forward, the enlarged semicircular canals - these are the anterior and posterior ones, for anybody who actually cares - are especially large. That gives them greater gain in their sensitivity to angular accelerations. Which then, through a three-neuron circuit to our brain activates, without any conscious effort, the eye muscles that actually then stabilize the gaze. So even when your eyes are closed and you move your head, your eyes, the semicircular canals, through that three-neuron system operates those muscles, keeping your gaze stabilized. It's that fundamental a system. We've upped the gain for that system, but even more interesting is that we've harnessed our arms and our butts to stabilize the head. When you run, and your head wants to pitch forward, which explains why we've lost a lot of the musculature of the upper body. If you look at a chimpanzee, it has this huge set of muscles that connect the head to the shoulder; the trapezius muscle is gigantic in a chimpanzee. They have muscles that we don't have, like the atlanto-clavicularis. There's another muscle called the rhomboid, which in humans is a little muscle that goes from the scapula to the spine. In a chimpanzee, it actually inserts on the head. The reason the chimpanzee has all those muscles that go from the shoulder to the head is that it enables the animal to climb effectively. We gave up climbing. We're the worst tree climbers in the primate world. We're actually bizarre to be primates that aren't very good in trees. I guarantee that probably almost none of us, anybody watching this video has been in a tree today, which is bizarre for a primate. The reason we gave up climbing was not because of walking but because of running. It turns out that we use our arms to stabilize our heads. So when you run, and you pump your hands opposite your legs, that arm has a mass that's about the same as your head. And the inertial force that causes your head to pitch forward also causes your arm to fall (the trailing arm, the arm on the side that hits the ground). We have a special muscle called the cleidocranial trapezius, which is a very slip of a muscle. It's about the thickness of a pencil. It goes from the clavicle and inserts on a midline structure in the head, which is in the sagittal plane, the midline structure. It turns on just before your foot hits the ground; that muscle then acts as a mechanical strut between the mass of the arm, which is falling down, and the head, which is falling forward. And it brings that mass of the arm, connects it to a spring-like structure called the nuchal ligament that is aligned in the midline of the head. And so the arm essentially pulls back your head just as it wants to pitch forward. We thus have what's called a passive mass damper system. It's totally cool. It works without you even ever having to know it operates. All you have to do is have a pattern generator, a muscle that turns on automatically before your foot hits the ground, and the body automatically corrects for a problem that we evolved because we're bipeds. It's evidence that humans evolved for running, that we started running maybe two million years ago. It's evidence that running is a fundamentally important part of our biology. It's evidence that athleticism is a fundamentally important part of our biology. I started looking at other features in the head, which also relate to endurance. For example, we have these enlarged noses. There's no other primate that can pick its nose. We have this large proboscis, with this extra vestibule in the front. Why do we have that? It turns out that that vestibule, that extra enlarged portion up there, is a turbulence generator. Air has to go upwards, goes through a little valve, which is called a venturi throat, which creates turbulence as the air then goes into the nose. Then it has to turn a right angle, which creates more turbulence. Then it goes through another little venturi valve to get into the middle part of the nose, where all the business of the nose is, where all the mucous membranes are that exchange heat and exchange moisture. By having turbulent airflow inside the nose, there's no longer what's called laminar flow in the nose. Air doesn't just stream into our noses. It's highly vorticial, and by being vorticial, it slows the flow rate down, and it means that there's no longer a boundary between the air running through the nose, and the mucous membranes of the epithelium in there. That means that there's intimate, prolonged extra contact between air from the outside world entering the nose and the mucous membranes. This enables us to be extremely efficient at humidifying and warming air as it comes in, and also extremely efficient at capturing that humidity on the way out so that we don't dehydrate. I also became interested in the relationship between heads and feet and running and athleticism and human evolution because of my research, but also because of that kind of interaction between research and life. I love to run. I started running when I was a teenager. I was never good at anything. I was never picked for any team, I was never a track athlete, I never ran for anybody. I just did it because it made me feel good. I figured out in high school that if I didn't run a few times a week, I would go nuts. I started becoming just a jogger, basically. I ran in college, and I ran in graduate school and I ran when I was a junior faculty. Just a few times a week, a few miles just to kind of keep sane. As I started studying the evolution of running, and features in our heads that made us good at running, I started thinking more about my own running. Before I knew it, it led to an interesting feedback relationship between my research and my pastime. We were doing some experiments trying to figure out how the arm stabilizes the head, and I remember in the lab we were trying to figure out ways to take the arm out of the equation. We would put people in straitjackets while running on treadmills or have them hold cups of water, whatever we could do. We were trying to keep the arm from jiggling about, keep it stable. I remember I was running through some park in Cambridge, Massachusetts, and I was probably doing something weird with my arms, holding them above my head, and I remember hearing some guy saying, "Oh that guy clearly has no idea how to run properly," which I thought was funny, but I also realized it was probably true. Although I was really interested in running, I loved running, I was doing more of it, I actually wasn't probably a very good runner. That's when we started studying barefoot running. I published a paper in the journal Nature with a colleague of mine, Dennis Bramble, in 2004 on the evolution of running. We made the case, which started with this work on the head, that humans evolved to run long distances and that the traces of our evolutionary history as runners started about two million years ago. Running was very important for the evolution of hunting. It enabled early humans to hunt, and that helped release a constraint on brain size, and it wasn't until after hunting and after running that human brain sizes started to increase. I gave a big public lecture about the evolution of running and why we run the Boston marathon. There was a guy sitting in the front row. I remember he had a big beard and he had on suspenders. But what was most interesting about him was that he was wearing socks wrapped in duct tape. I remember thinking it was some homeless guy from Harvard Square who had just come in out of the storm, he would just do anything to get out of the rain. But it turns out he was a Harvard grad who lives in Jamaica Plain here, runs a bicycle shop. He came up to me afterwards and he said, "You know, I love running and I hate wearing shoes, and I'm a barefoot runner. In fact, I just don't like shoes. Humans obviously evolved to run barefoot. Am I weird or am I normal?" I thought what a great question. Obviously humans did run barefoot for millions of years, and we know almost nothing about barefoot running and obviously he must be normal, from an evolutionary perspective, and people like me who wear shoes, are abnormal. At that time, I was struggling with plantar fasciitis. You get up in the morning and you have this pain in your foot, in the first few steps because the plantar fascia, a sheath of connective tissue, gets really stretched and it gets inflamed and it's poorly vascularized, and it really has a hard time healing. I was buying new running shoes every 250 miles, which is very expensive. I thought we should study this guy. I got his e-mail, brought him to the lab, and he ran in the lab. When we ran him across the force plate, he ran in this perfectly beautiful, light and gentle way. Most Americans, when we run, we land on our heels. We wear these big, thick, cushioned running shoes with lots of support and lots of cushioning, and those make it really comfortable, and let people slam onto the ground on their heels, but we have all of this stuff in the shoe that makes it really comfortable to land on your heels. But this guy didn't land on his heels. He landed with what's called a forefoot strike. He landed on the ball of his foot and then his heel touched down. He had no impact peak. An impact peak is a collision force when you have an exchange of momentum between two bodies. Momentum is mass times velocity and the period over which the body comes to a dead stop is when you exchange that momentum. When you drop anything really heavy onto the ground, there's a big peak of force. You just hear it when you drop something onto the ground. It had long been known that when people forefoot strike, there's no big peak of force. It's a gentle landing. But nobody bothered paying much attention to it, because most people land on their heels, not on their forefoot. In fact when we were doing experiments on head stabilization, I used to hate the forefoot strikers who came in the lab, and there were just a few of them, because their heads didn't jiggle as much since they were landing lightly and gently. It suddenly occurred to me when this guy, barefoot Jeffrey, ran across our force plate, that he must be normal and that I must be abnormal in the way I'm running in my stupid running shoes. We started getting other barefoot runners into the lab and found that all of them ran that way. If you were to take your shoes off and run down Fifth Avenue or Mass Avenue or wherever you live, you will quickly stop landing on your heels because it's profoundly painful. You can't slam into the ground with each step. You quickly transition into landing on the forefoot, because it doesn't have an impact peak. So we did some research figuring out what's the mechanics of that and what's the physics and it turned out to be a really interesting story. We also went to Africa and looked at people who have never worn shoes in their lives. It made me realize that running is a skill, and that we blunt that skill with technology. We wear these fancy running shoes, we get Gatorade, we do all this stuff and we no longer really pay attention to how our bodies are functioning. We don't really run very well. Actually, the world's best runners all grew up barefoot and they all are phenomenal runners. Recently, over the last five, ten years, I've been paying much more attention to not just my own running and how I use my body, but how other people outside the Western world use their bodies, and what those skills are and what that can teach us about how we can use our bodies so that we don't get injured. What I'm doing is part of a slow, gradual, very barely growing movement in biology and evolutionary biology, which we hope will become part of a larger movement in science in general. And that is using evolution to give us insights into how we use our bodies and medicine. There's a growing field of evolutionary medicine, which really started through George C. Williams in the 1980s. He and Randy Nesse wrote a really important book called Why We Get Sick, which helped launch the field of evolutionary medicine. Like many evolutionary biologists, I was inspired by the book, Why We Get Sick, by Nesse and Williams. In fact, when I was working on a previous book, I got fascinated by the question of how does the study of the evolution of the human head and the study of the evolution of running and the evolution of athleticism matter to human health today? To a large extent, I think there is a disconnect between evolutionary biology and not just the general public, but also people in other branches of biology, especially medicine, who should be interested in evolution but aren't. They still think evolution is irrelevant to medicine, and they think evolution is irrelevant to much of biology. In fact, if you put the word "evolution" in an NIH grant, it's probably the fastest way to not get funded. It's just not considered important. The work that we did on the evolution of running just touched a nerve. I got more than 1,000 e-mails after the first "Born to Run" paper in 2004, and recently with the barefoot running paper, I can't even tell you how many e-mails I've gotten. I still get five to ten e-mails a day from barefoot runners and shod runners all over the world. They're really interested in the evolution of running. Not just because it explains why they love to run, but also because understanding the evolution of running and understanding the evolution of walking helps explain why it's so important to human health. Even more importantly, from my perspective, it also tells us something about how we should be using our bodies. By studying barefoot running it occurred to me that it helps us to understand how the body was actually evolved to run. We didn't evolve to wear high-heeled cushioned shoes and crash into the ground. We actually evolved to run lightly and gently, because it hurts to land on the ground the way people do in shoes. Those adaptations, those sensory proprioceptive adaptations in the foot that cause pain are probably just that: adaptations. It also occurred to me that so much that's been done in evolutionary medicine has been primarily in infectious disease and in reproduction. We think a lot about the evolution of diseases like tuberculosis and swine flu and avian flu. Those are all evolutionary problems that have direct, immediate relevance to human beings. We spend a lot of time in evolutionary medicine thinking about reproduction and the conflict between parents and offspring, and the placenta, and energy, and nutrition. But evolutionary medicine is also relevant to many other aspects of our body, including obesity, cancer, knee problems, flat feet, shin splints and lower back pain. And that suddenly touched a raw nerve with me because I realized that by studying the evolution of the human body, we can address problems that seem to have been intractable. For example, many people are afraid of running because between 30 to 70 percent (depending on how you measure it) of runners get injured every year. The most common injury in the world is lower back pain. Something like 70 or 80 percent of people today get lower back pain and almost all of it is what's called non-specific. That is, we don't know what causes it. We often say the reason people get lower back pain is because we became bipeds and being a biped is a stupid way to use your back. But actually that doesn't make any sense, because if back pain is so difficult, such a challenge, natural selection surely would have acted to lessen the prevalence and severity of back pain. In fact, if you start asking people who work with hunter-gatherers, most people say yes, actually come to think of it, I don't really recall anybody saying that they had back pain. I've never seen anybody have back pain in the hunter-gatherer context. Our lives are filled with problems like insomnia and constipation that are extremely recent. They're novel, and they're caused by the way in which we misuse our bodies. The research that I'm doing now is really about how we can use our bodies better, particularly in terms of the musculoskeletal system, to avoid injury, to avoid pain, to avoid debilitating disabilities that then prevent people from exercising and staying fit. I would argue that many of the ways in which we get sick today have a corporate, almost capitalist origin. If you think about the obesity crisis, so much of the way in which people are getting sick today is because we've now created industrial food that makes sugar unbelievably cheap, that makes low-quality fats unbelievably cheap. We evolved profound, deep and serious cravings for fat and sugar because those used to be limited and important resources in our evolutionary history. It's also true for something as simple as shoes, or sofas or elevators. We like to take it easy. Typical hunter-gatherers were always at the edge of energy balance. They barely can get enough food to satisfy their needs and their family's needs so it makes sense when you're a hunter-gatherer, when you don't have to work, to take it easy. We're programmed to take the elevator or the escalator whenever we see it. In fact, there are experiments that show if you have a stairway next to an escalator, only about three percent of people will take the stairway instead of the escalator. If you put a sign up, that'll double to about six percent. People love to take the escalator. It's just hard-wired into our brains, I believe. That makes sense in a context in which you had to work very hard and you had to struggle to maintain energy balance. Shoes are another interesting example. We love comfort. We have this idea that things that are comfortable must be good for us. So people buy shoes that are comfortable. Well, since when was there a relationship between comfort and health? I would argue that a lot of shoes actually cause people to become injured because they're comfortable. An arch support in a shoe is comfortable because that arch support means that the muscles in your foot no longer have to work anymore to support your arch. It's like taking the elevator all day long. Those muscles then atrophy, or they never even develop properly if you give kids arch supports. Their arches don't even develop properly, or they collapse pretty quickly. Twenty-five percent of Americans have fallen arches, which is an amazing statistic. In the Kenyan villages where I work, where people don't wear shoes, I have yet to find a single person with a fallen arch. They just don't exist. Maybe we'll find one eventually, like a black swan. But they're obviously extremely rare, those kinds of foot problems. They may have all kinds of crud in their feet and they have other shoe problems and foot problems, but collapsed arches don't seem to exist in barefoot populations. We have been marketed and sold all kinds of products that we'll willingly buy because they're comfortable. Air conditioning makes us comfortable, but is it good for us? Probably not. The list goes on. Comfortable chairs, for example. Just think about how bad chairs are for us today. Paper after paper, study after study, have shown that chairs give us back problems because they shorten our hip flexors, give us weak backs, of course it make us sedentary. We take years off our lives probably by sitting in chairs, but we like them because they're comfortable. You go to an African village, you find me a chair with a back. That's a rare thing out there. We love comfort, and people make a lot of money selling us comfort, but I would challenge the notion that comfort is usually good for us. One important question is can we test is the idea that a more evolutionarily informed way of using our bodies is actually relevant to helping people. One is the idea that a more barefoot style of running is less injurious. If you study barefoot runners, not only do they tend to land on their forefoot, but they tend to take shorter strides, they have better posture, and there are a number of other things that are different between typical barefoot runners and typical shod runners. As a way of testing that, we actually measured the Harvard track team. We looked at all the people who run middle and long distance on the Harvard track team. Some of these kids are running 40, 50, some of them are even running 100 miles a week, really fast. It turns out about a third of them are forefoot strikers. They run with more or less what I would say is a good barefoot style. It turns out also that the Harvard track team has a great doctor and a trainer that have recorded every single injury. When they get scratched or even just get a shin splint or a muscle tic, anything that happens to these kids gets written down and is diagnosed by a professional. The track team coach also requires them to log their mileage every single day, how far they ran and at what speed. For some of these kids we had four years of data. So we took a high-speed camera, measured how they ran, and then compared the ones who ran with a forefoot kind of barefoot style versus those who landed on their heel. We found that we could assess how severe each injury was because we could measure how much effect each injury had on how many days they had to take off, and come up with a quantified injury severity score. When you quantify injury in a sensible way like that, the runners who were forefoot strikers had 2.6-fold lower injury rates than the heel strikers. In other words, if you landed on your heel, you had a 2.6-times greater chance of having a severe injury than if you landed on your forefoot. It's a huge difference. As far as I know, it's the biggest effect ever shown on running injury, and it's a perfect example of how taking an evolutionary approach to the body gives us insights about how to better use our bodies.